Displays timing information and sampling rate. Plots the waveform and information of the CORE24 data files. 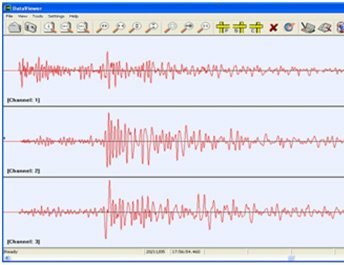 Tools for fast event location & magnitude. The DataViewer user interface supports powerful features which are divided into five groups, each selected by clicking on the appropriate menu. Clicking the appropriate icon on the tool bar can also access most of the available features. The DataViewer screen works with and displays data from one or two files at a time. When first opened the graphic display is blank. You must select and load a file before the other functions of the DataViewer screen become available. Ability to support any custom format. 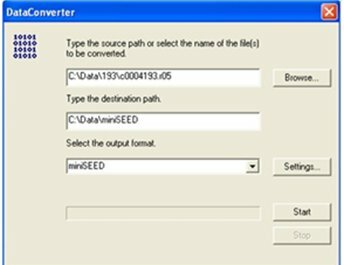 The DataConverter makes it possible to quickly and easily convert CORE24 files to ASCII or MiniSEED format. You can use DataConverter to convert a single file, a group of files or all files in a directory. 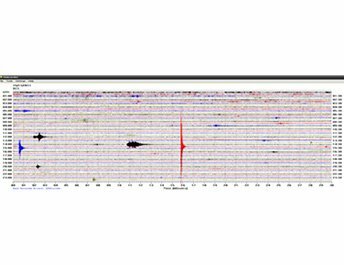 The Helicorder open window shows a record of how the ground moved at a particular seismograph station during a 24-hour period. The graph is “read” like a book, from left to right and top to bottom (this is the direction that time increases). As with a book, the right end of any horizontal line “connects” with the left end of the line below it. The colours of the horizontal lines have no particular significance. Different colours have been used to facilitate the reading of the graph. The horizontal and the vertical lines are presented to indicate equal intervals of time. Plots the waveform of the CORE24 data directories (24h). Tools for plot, end editing with DataViewer. Gives clear picture of a 24h records. 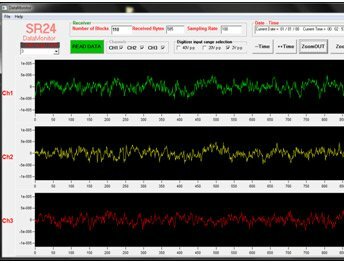 The Helicorder application supports dynamic data visualization. When a source directory is selected, a new file search procedure starts. If there are valid files in the source directory, the graph is updated and a new file search procedure is executed every a period of time defined by the duration of the files. Otherwise, the search procedure is executed every 1 minute by default. When a day changes and a new directory is created, the source directory also changes. The new graph will be updated as soon as the first file of the new day is created. Until then the graph of the previous day is used. Each time the graph is updated a new bitmap file is created. In addition, the user has the option to send this file to a server using FTP functions.